Early progress is seen in the slate roof replacement project at St. Peter’s Episcopal Church in Mountain Lakes, New Jersey, in this photo posted to the church’s Facebook page on Oct. 12. [Episcopal News Service] It was an offer too good for a congregation to refuse. Need your church tower preserved? Your roof replaced? Your parish house restored? Morris County, New Jersey, was ready to help, with a historic preservation grant program offering hundreds of thousands of dollars in upkeep assistance for a range of properties, including houses of worship. The problem: Such direct taxpayer assistance to churches violated the state constitution, the New Jersey Supreme Court has concluded, ruling April 18 against a list of defendants that includes 12 churches, three of them Episcopal churches. The potential financial ramifications for Morris County churches are significant. The Episcopal Church of the Redeemer in Morristown, as one prominent example, received a $294,000 grant in 2013 to restore its 1926 parish house and an additional $272,000 in 2015 to restore the church’s slate roof. The court did not require the Church of the Redeemer and the other 11 churches named in the lawsuit to repay the $4.6 million they received over four years, but the county is barred from awarding money to churches in the future. “The historic preservation grant we received saved our bacon,” Donald MacGowan, senior warden at St. Peter’s Episcopal Church in Mountain Lakes, told Episcopal News Service. The church, one of the defendants in the lawsuit, spent $450,000 on a new slate roof, including $262,000 from the county fund. The Wisconsin-based Freedom From Religion Foundation and a Morris County resident sued in 2015, arguing that the grant program was in clear violation of the Religious Aid Clause in the New Jersey Constitution. The county and churches countered that the grants were legal because they advanced the public’s interest in historic preservation and that excluding churches from such a program would violate the U.S. Constitution’s First Amendment protection of religious freedom. Morris County’s Historic Preservation Trust Fund was created after a 2002 voter referendum. Its goal was to support acquisition and preservation of historic sites and facilities, and in nearly 16 years, it has awarded millions of dollars to a variety of sites, including numerous churches. “In Morris County, as in all counties in New Jersey and across the nation, churches and other religious buildings are a vital part of the historic fabric of where we live, interwoven in the history of how our county, state and nation developed,” Morris County Administrator John Bonanni said in a statement released after the state Supreme Court ruling. The Church of the Redeemer received construction grants in 2013 and 2015. A county news release noted the church’s 2013 grant was the fund’s largest of the year. A 2015 news release touted the 1917 church’s Gothic Revival style, its architectural pedigree and its place on state and national historic registers. St. Peter’s Episcopal Church in Morristown, another church named in the lawsuit, received a 2012 grant of $428,000 to preserve the interior of its church tower. The state Supreme Court noted that the church’s application explicitly connected the project to the congregation’s ability to worship safely in the building. “These are really hard times for houses of worship. And we really do so much for the community,” the Rev. Janet Broderick, rector of St. Peter’s, told MorristownGreen.com after the state Supreme Court ruling. St. Peter’s in Mountain Lakes received $13,000 in 2015 for a preservation study, another $13,000 in 2016 for “construction documents” and $262,000 in 2017 for roof replacement. That project is detailed in photos posted on the church’s Facebook page. Whatever the beauty of such projects, the state Supreme Court ruled, 7-0, that the county can’t pay for them. “The plain language of the Religious Aid Clause bars the use of taxpayer funds to repair and restore churches, and Morris County’s program ran afoul of that longstanding provision,” Chief Justice Stuart Rabner wrote in the decision, which reversed a lower court’s decision in favor of the county and churches. The other question raised by the lawsuit, however, was whether the county program was protected by a 2017 U.S. Supreme Court decision siding with a Missouri church, Trinity Lutheran, that had applied for state aid for day care playground improvements but was denied. The New Jersey court ruled that the Morris County program was different because it offered widespread benefits to churches, including for improvements that directly supported the congregations’ spiritual missions. MacGowan acknowledged some residents may not be happy with tax dollars being spent on church buildings like St. Peter’s. “On the other hand, there’s a lot of history in Morris County, and it’s integral to who we are,” he said, and to preserve church buildings that embody that history often requires more money than today’s congregations can afford. “I feel terrible for the [churches] that will not now be able to do this,” he said. The county and churches could pursue their legal fight in federal court. 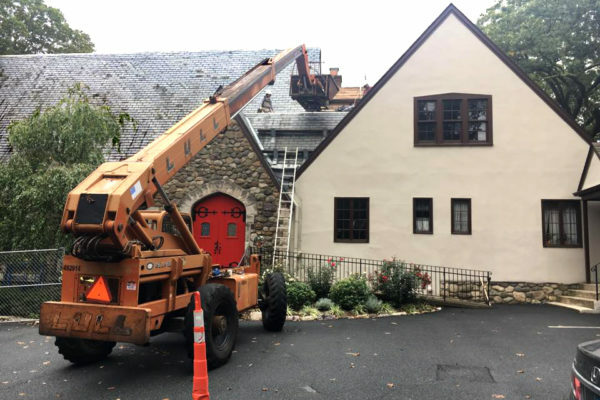 For now, congregations like St. Mark’s Episcopal Church in Mendham will have to move forward with any construction projects without the help of Morris County. “The issue for us, being a smaller congregation, is we don’t have a whole lot of money sitting around,” said the Rev. Shawn Carty, part-time rector of St. Mark’s, which was not a defendant in the court case but received a 2016 county grant of $30,000 to conduct a detailed preservation study. That study did not identify urgent need at St. Mark’s for any preservation projects on the scale of those carried out by the Episcopal churches named in the lawsuit, though Carty said he would have welcomed county assistance for smaller projects, such as repairing his church’s stained-glass windows. Carty said the preservation study alone was a significant value for the congregation, which has an average Sunday attendance of about 40. Such studies are a county requirement before sites can apply for money for construction projects. The state of Florida handles this by offering competitive matching grants to historic structures owned by churches only for the outer envelope. The rule is “what can be seen from the street.” Thus the public need to preserve historic structures is met while it is the responsibility of the church to maintain the inside of any structure used for religious purposes-even schools. Owners of a structure on the National Registry of Historical Places have obligations and restrictions when it comes to preservation of their building. This is the result of a consideration in the public interest that the building is of historical and cultural value to the community, in many cases preserving and embodying a part of the story and values of the community and contributing to the beauty of the community. That designation creates a partnership between the building ‘s owner and the community that should permit public participation in the funding for preservation.